This ten armed statue represents India's most extensively worshipped deity goddess Kali, also called Mahakali, or Smashana-Kali. Kali cult and Kali worship prevail in India from a shrine to a cremation ground, from a metropolitan city to a tribal hamlet, from a Brahmin's abode to a Shudra's mud-house and from a sage's hut to a dacoit's hideout. The dark complexioned deity prefers her worship during dark nights inside deep dark chambers, inaccessible recesses of uninhabited deep forests or cremation grounds where sound of cracking woods of a burning pyre alone breaks the silence of death. Kali bestows no bliss but her devotees believe all blissful in life is only her boon and she takes life as sacrifice, dances around burning pyres and consume fresh human blood but to her devotees there is none so benevolent as her in giving life and all that makes it blissful. To them, she is the most auspicious spiritual presence around wherever they are. Kali has been conceived as an awful appearance imparting destruction and as one who is usually gaunt, has fangs, laughs loudly, dances madly, wears garlands of corpses, sits on the back of a ghost, feeds herself on fresh human blood and resides in cremation ground, but quite strangely, despite this ugly or non-aesthetic appearance, she has been the first love, not only of the violence-edict warriors, thieves, plunderers, violent tribes or charmers but also of poets and dramatists from all over the land and from all ages. 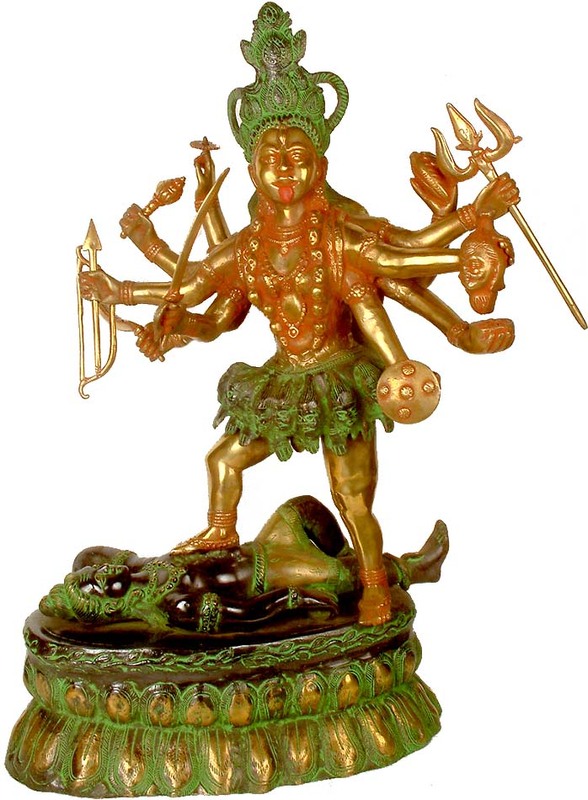 Significantly, early textual allusions to Kali worship first occur, in around sixth century, in literary works of these Sanskrit poets and dramatists. In religious texts and authorised rituals her appearance is subsequent. 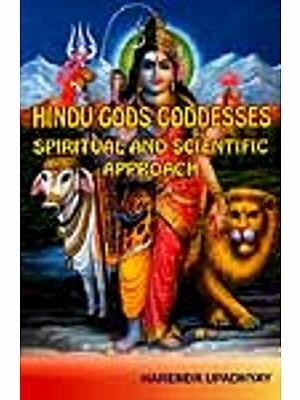 This phenomenon suggests that she must have been a significant deity of various tribal pantheons of the subcontinent since long before and her accession in Brahmanical rituals was late. The earliest religious texts that prescribe her rituals, authorised iconography and form are mainly the Agni Purana, Garuda Purana, Devi Purana and Bhagavata Purana. In these 'puranas' Kali has been described as the goddess bringing success in war and eliminating enemies. Like other female deities, she did not carry in her hands rosary, lotus, pot or anything which promotes life. She also did not raise her hand to bless or to impart 'abhaya'. Rather as the goddess of war, destruction and violence, she not only had multiple hands varying from four to twenty but also carried in them means and exploits of war. Some texts consider her as an aspect of Durga, though the tradition of her massive worship and independent status hardly support this view. There prevails, with greater unanimity, the view that she is Shiva's consort who dominated him. She is hence often represented as standing on Shiva's figure and Shiva is seen, as in this statue, as lying under her feet. As prescribed in these 'puranas', this statue of the goddess carries in her ten hands drawn sword, bow and arrow, sickle, mace, discus, shield, bowl filled with blood, decollated human head, trident and conch. On her waist she is wearing the girdle of alike-dismembered human hands and decollated heads and a garland of skulls on her breast. Her eyebrows consist of venomous female serpents. She has her blood smeared tongue rolling out her mouth. The statue is essentially votive, but artist's vision of the deity is as much aesthetic. The lofty crown provides a pleasing contrast. Her round face, sharp features, proportionate figure, amicably branched arms, fine long fingers, slim elegant figure, well shaped eyes, befitting ornamentation and serenity on face could as well be the features of Lakshmi, Psyche or Venus. The artist has skillfully packed in a single form the ever conflicting elements - awe and beauty. 21" X 13" X 6"